Condition is Used. Dell Poweredge R910 ii. 2x 146GB hard drives in RAID1. 4x E7-4830 8-core CPUs (32 cores in total, so 64 with hyperthreading). 4x 1GB on board network ports. 1x Rail kit. 2x SD slots (I have had ESX 6.7 running off cards I had in them). CPU: X7560 x 2, 2.27GHz - 2.67GHz, 16 Threads, 24MB L3 Cache, 8 Core CPU. H700 Raid Card with 512MB Cache plus battery. Model: R910 2.5" 16 Bay. Storage: 4 x 300GB Dell 10K SAS HDD. Buy it Now! The images used are for illustration purposes only. Dell PowerEdge R910. We are able to source hard to find parts for Legacy systems through to the latest new in box parts for the latest generations of servers & storage systems. Any hard drives (if included) have been data wiped and work. 256GB DDR3 RAM (32 x 8GB) with 32 slots for expansion. 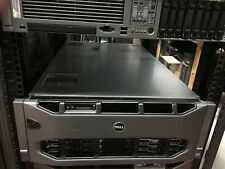 Dell PowerEdge R910 4U Rack Server. 16 x Dell 500GB SAS 2.5" Drives. Fully Tested. DELL PowerEdge R910 Rack Server. Tested / Preinstalled with VMWARE ESXI. 6.5 on 16GB USB (included). Storage: 4 X 120GB ENTERPRISE SSD s 8 x 146gb 10k SAS included. Backplane: 2x 8 Bay 2.5” SFF SATA /SAS /SSD. DELL Poweredge Servers. 256GB DDR3 RAM. Dell Poweredge 1950. Dell Poweredge 2950. Dell Poweredge R410. Dell Poweredge R510. Dell Poweredge R610. Dell Poweredge R710. H700 Raid Card with 512MB Cache plus battery. Model: R910 2.5" 16 Bay. Storage: 4 x 300GB Dell 10K SAS HDD. CPU: E7-8837 x 4, 2.66GHz - 2.80GHz, 8 Threads, 24MB Smart Cache, 8 Core CPU. Buy it Now! The images used are for illustration purposes only. 2x600GB 10K 2.5“ SAS drives in hot swap caddies. (windows drive in raid 1 capacity 600GB). - 14x600GB 10K 2.5“ SAS drives in hot swap caddies. - 4U Rack Server ( front bezel and key not included). Dell Poweredge R910. DELL Poweredge Servers. 256GB DDR3 Installed. Dell Poweredge 2850. Dell Poweredge 1950. Dell Poweredge 2900. Dell Poweredge 2950. Dell Poweredge R200. 256GB DDR3 RAM. DELL Poweredge Servers. Dell Poweredge 1950. Dell Poweredge 2950. Dell Poweredge R410. Dell Poweredge R510. Dell Poweredge R610. Dell Poweredge R710. They are in excellent physical condition and have been tested and certified to be in good working order. Model:PowerEdge R910. Storage :4 x 300Gb SAS Dell 10k drives. Manufacturer: Dell Inc. Processors: Physical CPUs: 4, cores: 32. DELL PowerEdge R910 Rack Server. Storage: 4 X 120GB ENTERPRISE SSD s 12 x 600gb 10k SAS included (7.2TB RAW SAS Storage) . 600GB 2.5" 10K Hotplug SAS Drive £129.50. Backplane: 2x 8 Bay 2.5” SFF SATA /SAS /SSD. DELL PowerEdge R910 Rack Server. Storage: 4 X 120GB ENTERPRISE SSD s 6 x 600gb 10k SAS included (3.6TB RAW SAS Storage) . 600GB 2.5" 10K Hotplug SAS Drive £129.50. Backplane: 2x 8 Bay 2.5” SFF SATA /SAS /SSD. 1 x Dell iDRAC 6 Enterprise. IDRAC 6 ENTERPRISE SUPPORTS PowerEdge R510. PowerEdge T610. 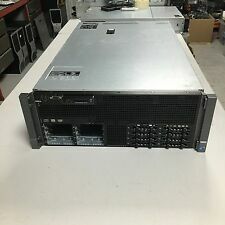 PowerEdge R610. PowerEdge T410. PowerEdge R910. PowerEdge R710. Dell Poweredge R910. DELL Poweredge Servers. Dell Poweredge 2850. Dell Poweredge 1950. Dell Poweredge 2900. Dell Poweredge 2950. Dell Poweredge R200. Dell Poweredge R410. Dell PowerEdge R410. Dell PowerEdge R610. Dell PowerEdge R710. Dell PowerEdge T310. Dell PowerEdge T410. Dell PowerEdge T610. Dell PowerEdge T710. Dell PowerEdge M610. Dell PowerEdge R910 4U Rack Mount Server. Dell PowerEdge R910. Blade Server. Server Options. Server Racks. Four (4) Xeon E7-8837 2.66Ghz 8-Core Processor. No Rack Mount Rails Included. Systemax Technologies Pty Ltd is a trusted supplier of servers, options, storage and networking products, server racks, high end workstations and much more to organisations throughout Australia. We do not take any responsibilty after this. Ending Soon. New Arrivals. QUICK LINKS. Desktop PC. PC Components. Why Choose Us! Audio Visual. This Dell PowerEdge R910 rack server is the perfect machine for you if you need a powerful server at an affordable price. Quad (4) Dell PowerEdge R910 redundant xxxW hot-plug auto-switching universal 110/220V AC power supplies. DELL PowerEdge R910 4xL7555, 32x4GB, H700-512MBwB, 4xPSU, 16x2.5"
The Dell™ PowerEdge™ R910 provides performance and reliability in a scalable 4U, four-socket server allowing large workload consolidation or max virtualization machine density.The PowerEdge R910 is built for reliability through factory integration and validation. New pulls from new servers. Dell PowerEdge R910. NEW BOX OF DELL HEAVY DUTY Rail KIT, BEZEL INCLUDED. 128GB RAM DDR3 MODULE. 40 Cores 80 threads. 4x10 Core E7-8867L. 16 unit of generic 600gb sas 10k hdd = 9.6tb storage. We will resolve the problem directly with you. Dell Poweredge R910. Dell PowerEdge R910 4x E7-8867L 2.53Ghz 10-CORE 256GB DDR3 16x600GB SAS 10K ( total 40-CORES ). DELL Poweredge Servers. Dell Poweredge 2850. 256GB Installed - ( call for upgrades ). Dell Poweredge R910. 256GB DDR3 Installed. DELL Poweredge Servers. Dell Poweredge 2850. Dell Poweredge 1950. Dell Poweredge 2900. Dell Poweredge 2950. Dell Poweredge R200. Dell PowerEdge R910 4x E7-4870 2.40Ghz 10-CORE 256GB DDR3 12x600GB SAS 10K ( total 40-CORES ). Dell Poweredge R910. DELL Poweredge Servers. Dell Poweredge 2850. 256GB Installed - ( call for upgrades ). Dell Poweredge R910. Dell PowerEdge R910 4x E7-4850 2.00Ghz 10-CORE 256GB DDR3 16x600GB SAS 10K ( total 40-CORES ). DELL Poweredge Servers. Dell Poweredge 2850. 256GB Installed - ( call for upgrades ). 4x X7550 2.00Ghz 8-CORE(Total 32 Core). Dell Poweredge R910. DELL Poweredge Servers. Dell Poweredge 2850. Dell Poweredge 1950. Dell Poweredge 2900. Dell Poweredge 2950. Dell Poweredge R200.